I’m off to a school field trip (outdoors on the hottest day of the year) with my daughter today. 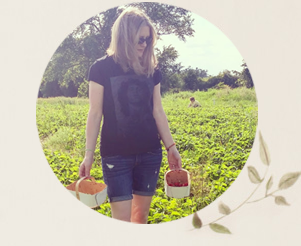 So, here is my quick look at highlights from a week of eating. 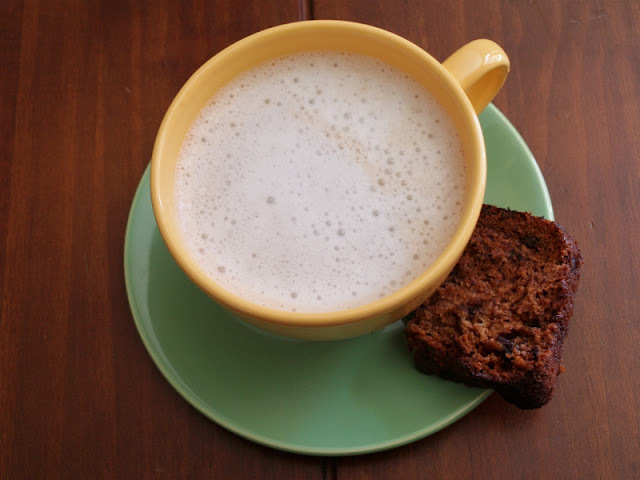 For a mid-morning snack one day, I made a latte with coconut milk. Not bad, but not as tasty as soy milk. I paired it with some fresh baked vegan banana bread. 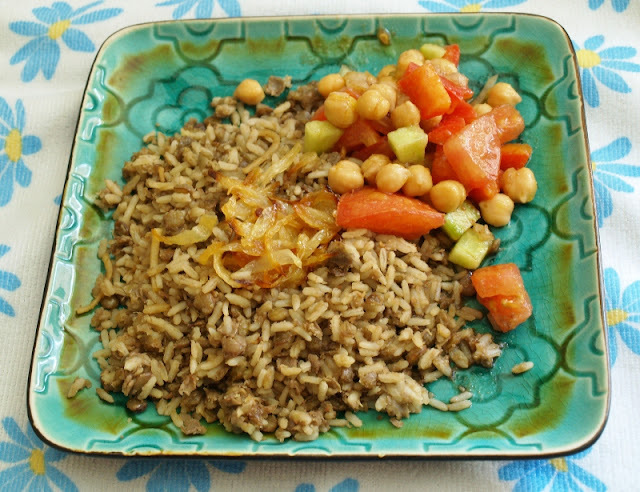 My Friday lunch was leftover lentils and rice with a chickpea and tomato salad. On Sunday, we had a Father’s Day breakfast of pancakes, veggie sausage and eggs. Here’s my husband’s tray. The rest of us ate at the table. 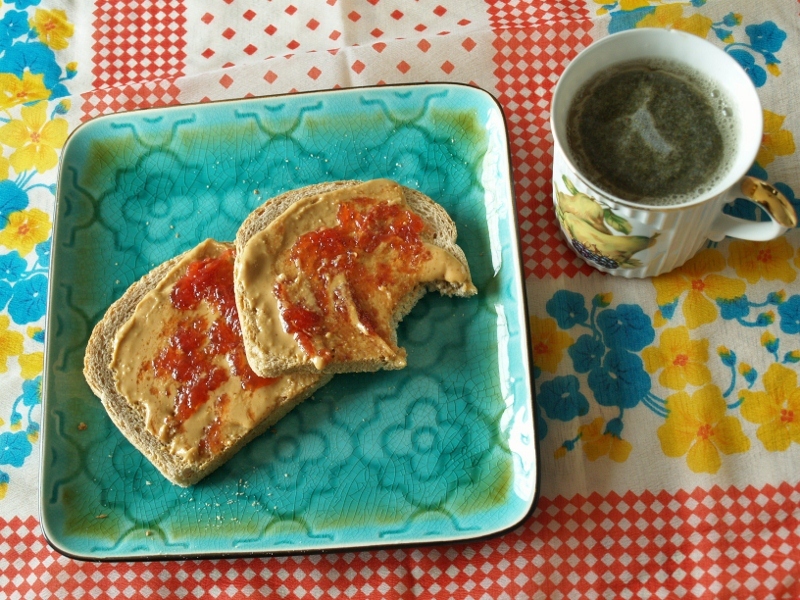 If I don’t have steel cut oats for breakfast, I’ll just throw some spelt bread in the toaster and top it with peanut butter and jam. Plus, decaf green tea with the bag right in. 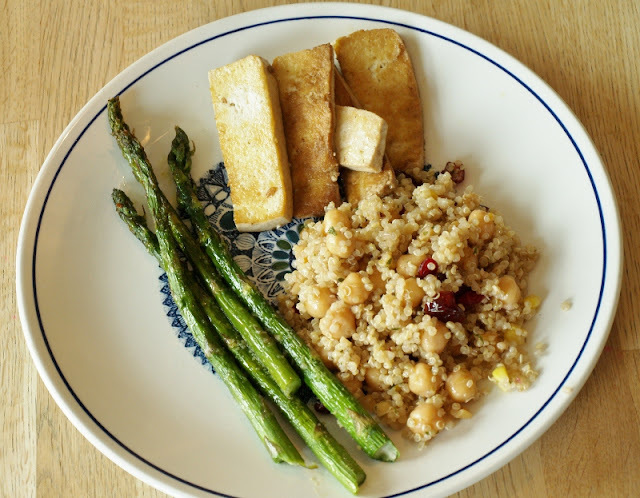 Monday dinner was asparagus and tofu sautéed in Bragg’s and olive oil, as well as this chickpea quinoa orange salad. We had fruit for dessert. Tuesday lunch was toasted spelt bread with salted tomatoes, avocado and a Tofutti vegan cheese slice. 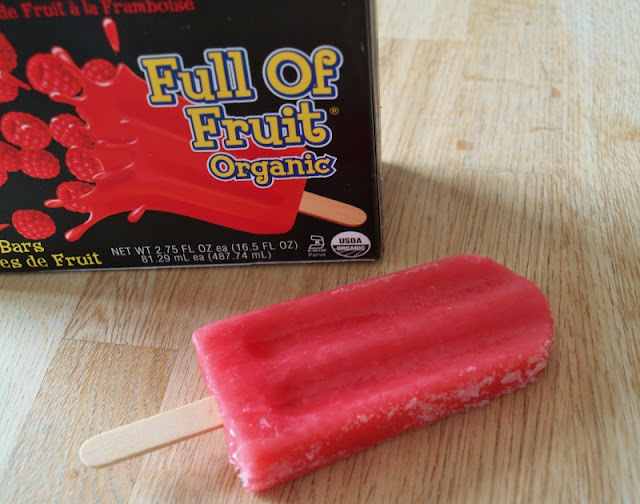 Mid-afternoon, I had an organic raspberry frozen fruit bar. What was your favourite food this week? How are you beating the heat? Good luck on the field trip (I dread those). 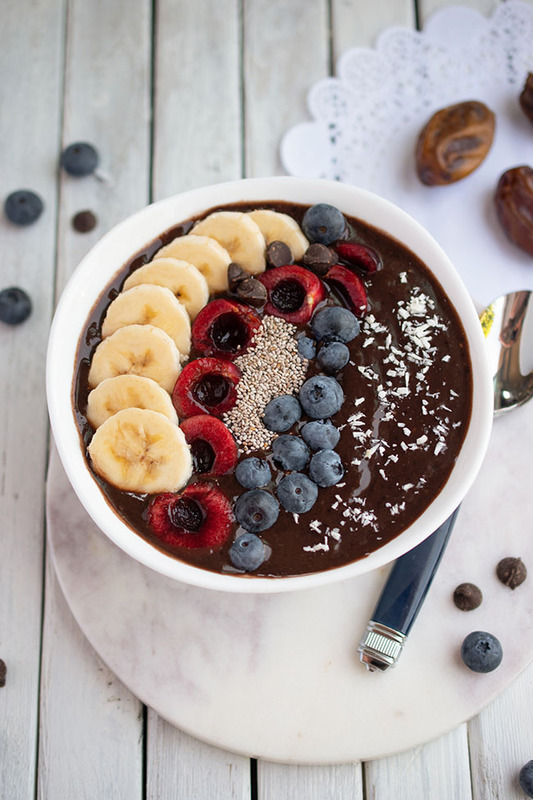 The coconut milk paired with the coffee sounds kind of good! It all looks delicious (only I have issues with tofu, lol). That's beautiful Father's Day tray! 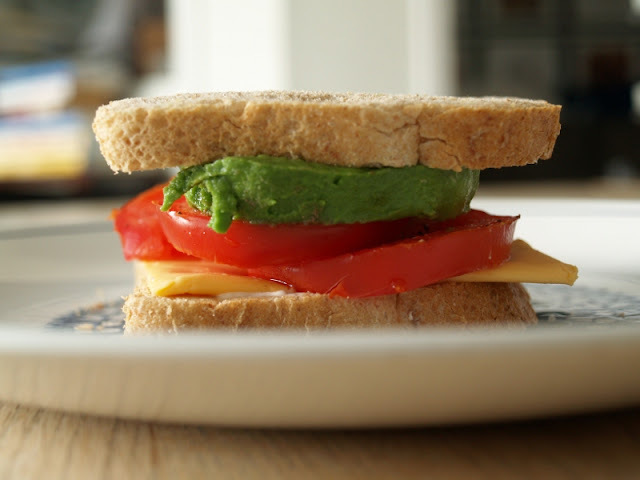 Everything looks good- but the sandwich looks very tasty for a hot summer's lunch. I love how you've staged your meals! I definitely need to get in the habit. This gives me all kinds of ideas for yummy vegan/vegetarian meals, too! Usually I just want to eat, so it is very quick staging. :) Glad you got some ideas. That's great! Try & stay cool today!! Yum. Fresh berry popsicles sound perfect right now! Yum- I want that banana bread (I might have to make some now!). Funny because I had an almost identical meal to your monday night tofu last night... and it was very tasty. 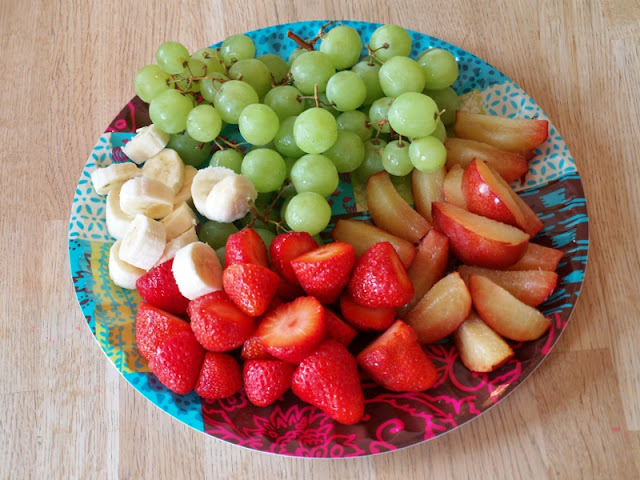 It all looks so yummy, and healthy! I've been eating peanut butter and apples. I'm not really hungry when it's hot out, so I've been surviving on that! I know what you mean. Not as hungry either. PB and apples sounds great! The banana bread sounds and looks fabulous! Thanks for sharing the recipe! No problem! Hope you get a chance to try it. That banana bread is on my list of To Do/To Eat! Here in Melbourne we didn't have a hot day, we had a 5.3 earthtremor/earthquake though! When I could hear my dishes rattling I thought "waaah my Johnson Brothers!!!" 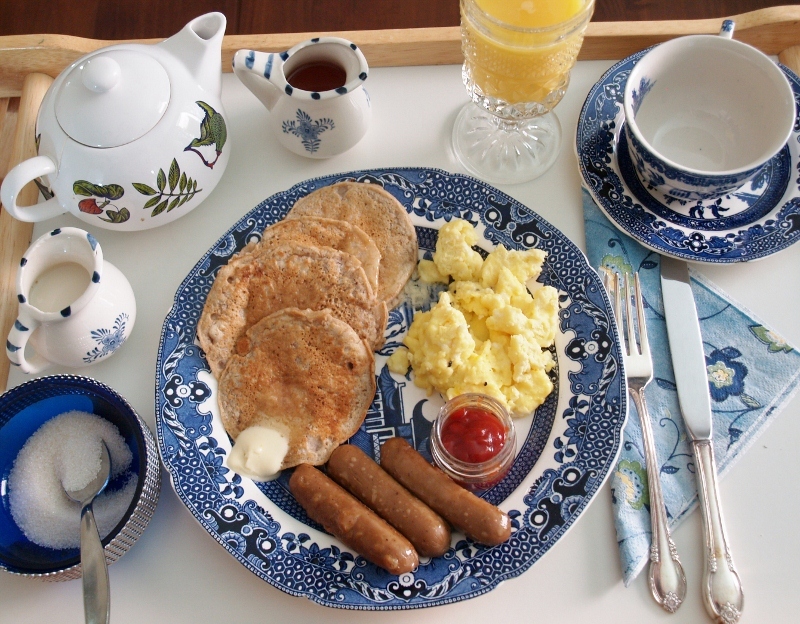 I love your father's day china and the blue plate below- so pretty! I'm also going to check out your banana bread recipe- I always have LOADS of bananas! Thank you! I always have bananas around now so I can make banana bread when the craving hits. That's great that you found the source of you stomach problems. Hopefully you are not too attached to dairy. I don't miss it, but my family still eats cheese. and kudos to you for isolating that fruit as a snack! I missed the wow party this week! Hope to be back next week. I love that the daddy in your house got served breakfast in bed! Yum, strawberry quinoa salad sounds delicious!